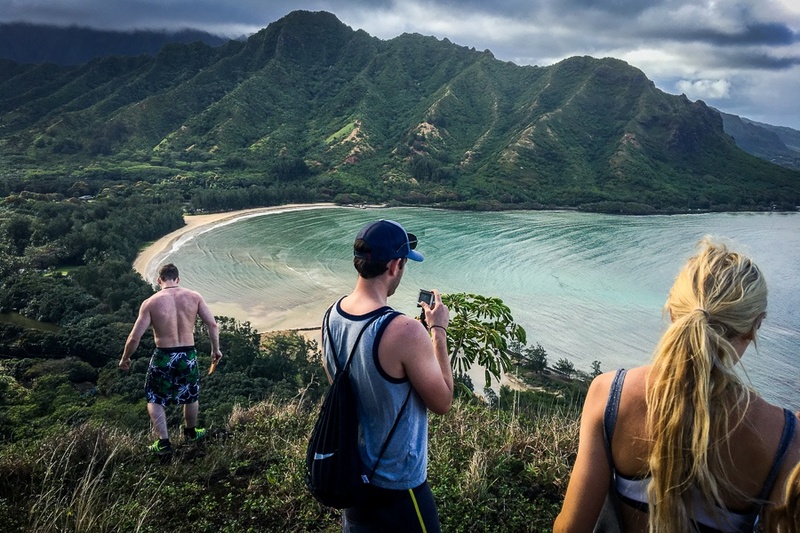 Crouching Lion is a short but epic hike in Oahu that ends with a panoramic view of the mountains and jungle at Kahana Bay. I’ve done this hike a bunch of times and it’s one of my favorites. The 20-30 minute hike on a dirt trail takes you up the side of a steep hill. You’ll be exhausted and panting on the way up, but the trail to the first viewpoint isn’t dangerous at all. Elevation gain is only about 200 feet, but it feels like more because the distance is so short. Just remember to bring some water. Do keep an eye on weather conditions, because the dirt trail is steep and it gets very slippery and annoying after a big rain. I’ve done the Crouching Lion hike 4 or 5 times now, but this view never gets old. After 20 minutes of hiking, you’ll reach a flat hilltop where you can stop and take in the incredible views. It’s super quiet and peaceful. The only sound is the breeze in the trees. There are steep drop-offs here that could be fatal, but it’s not an issue if you stay back from the ledge. There’s plenty of room to walk around on the hilltop safely, even if you’re in a group. If you go east from here, there’s a rock platform you can scramble onto for even better views of the ocean and mountains. This clump of rocks is the ‘crouching lion’ that the hike gets its name from. You can stop at this hill, or keep going up the mountain and this trail will eventually merge with Puu Manamana, one of the scariest and most dangerous cliff trails in Hawaii. Not recommended unless you know what you’re doing! As of 2019, this trail is closed to the public. The state of Hawaii has made the ridiculous decision to close this area and ticket anyone caught coming down the trail. I assume this is because they’re wanting to limit access to Puu Manamana, which is a much more treacherous hike and shares a trailhead with Crouching Lion. But the reality is that most people were using this trailhead to do the short and easy hike to the Crouching Lion hilltop, which is one of Hawaii’s best hikes. In any case, a cop has been posted near the trailhead lately, and several people have already reported getting citations. If you’re still interested in doing this hike I’m sure it’s possible, but you will need to find a different route and a new place to park. You can reach this hilltop with a safe, easy hike that only takes about 20 minutes. While you’re at Crouching Lion, don’t forget to check out the beach that wraps around Kahana Bay. It’s just across the road from where the Crouching Lion trail starts, and the views from this beach are completely epic. It’s usually empty, too! You can camp at this beach park with a permit, and it’s a great place to hang out before or after doing a hike. Kahana Bay is near the trailhead, and definitely worth checking out too if you have time. The Crouching Lion trail is located on the northern windward side of Oahu, just 4 miles up the road from Kualoa Ranch. There is a small parking area for cars, or you can also get here by bus. The hiking trail starts across the road from where you park, just east from where the pin is on the map. You’ll notice there are actually 3 or 4 different unmarked trails here, but they’re all the same thing — you can take any of them because they all go to the Crouching Lion viewpoint.